What Lexie Loves: The most thrilling and exhilarating play ever watched by man-kind: Emil and the Detectives. 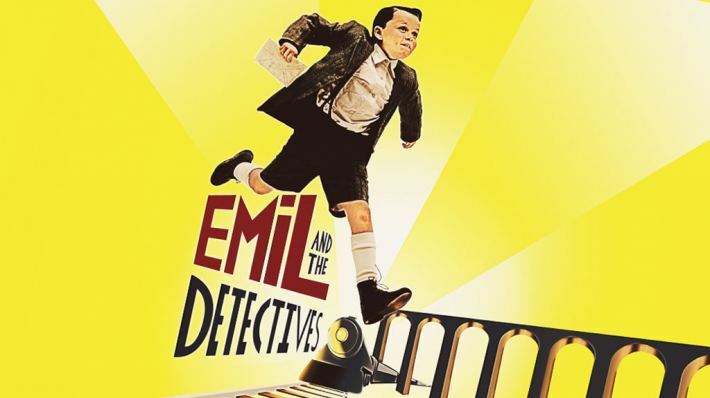 The most thrilling and exhilarating play ever watched by man-kind: Emil and the Detectives. Yesterday, I was very lucky as I was invited by Martin from the National Theatre through a great website called Kids' Blog Club to go and watch the play Emil and the Detectives. I was over-the-moon when I found that I was going. Emil and the Detectives is about a boy called Emil who is leaving his town on his own for his first time to meet his cousin Pony and his Grandma in Berlin. Whilst asleep on the train an evil guy named Mr Snow stole all Emil's money. A whole 140 Marks (which in the time it's set in was a lot). So Emil and his new friends set off to get that money back. And they're very determined. When I first arrived at the National Theatre my mum and I picked up our tickets and walked to our seats. They were brilliant seats - right near the front but not too close, just the perfect seats the watch the perfect play. It was really great because our tickets said PRESS on them. I thoroughly ADORED Emil and the Detectives for many, many reasons. One of these was that the acting was great and the setting was absolutely marvellous, mysteriously played with all the torches so you felt like you were a child in the busy, scary bustle of Berlin. It was funny, serious, a little scary at times, exhilarating and overall fantastic and mind-blowing. Also the music was there helping the scenery and acting used in the rightest of times. Last night was thrilling. My favourite character has to be Pony the Hat as she was really funny, relaxed, laid-back and NOT old-fashioned!! Whatevs! Her actress was very lucky that she was given a great character - which she played so well. Maybe she didn't need to act! If you are 8+ who loves any kind of play mystery, comedy, history this has got it all. My mum really loved it too so it's not just for kids. Thanks so much to Martin for inviting me and Kids' Blog Club for writing about it as I had an 'amazing experience'. Hi Marcie, yeah the scene was brilliant, really set the mood. I think I spotted that letter Mr Snow stole. And the sewers bit was one of my favourites. Hi Lexie,it's me Aziz what was your favourite part?Mine was the bit n the train.I thought it was really well presented! I loved the train bit too! I also liked the dance on the streets of Berlin when he arrived and the sewers bit.